Father Robert Holet has served as Pastor of St. Nicholas since its founding in 1998. He currently serves on the Council of the Metropolia of the Ukrainian Orthodox Church of the USA as well as the Director of the Consistory Office of Stewardship. Fr. Robert has also served on the Consistory of the Church, as the Treasurer of the Metropolia, and as an adjunct professor at St. Sophia Seminary (South Bound Brook, NJ) and St. Vladmir's Orthodox Theological Seminary (Scarsdale, NY). The history and importance of stewardship in the Church is a particular area of interest for Fr. Robert's ministry. In 2006, this interest led to the completion of a Doctor of Ministry (DMin) degree at Pittsburgh Theological Seminary, focusing on the role of stewardship in Orthodox Christianity, with particular emphasis on the mission parish context. 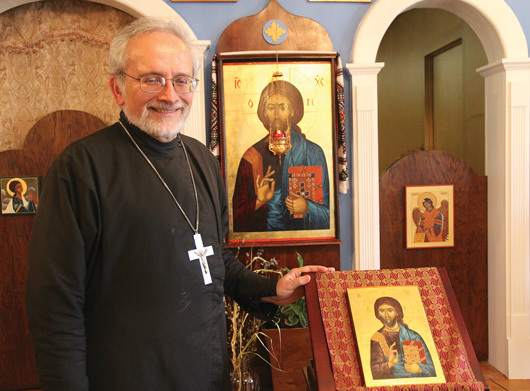 He has given numerous presentations to clergy groups, parishes and Orthodox jurisdictional assemblies on topics relating to the biblical and theological practice of Orthodox stewardship. In 2013, this work was summarized in Fr. Robert's first book, The First and Finest, Orthodox Christian Stewardship as Sacred Offering (Authorhouse, Nov. 2013), which is available through major book sellers online. Fr. Robert is now developing a separate website to serve as a resource for stewardship in Orthodoxy. Fr. 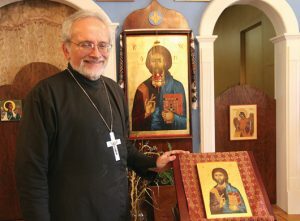 Robert is blessed to walk through life with his beloved wife and co-minister, PaniMatka Christine Holet, who has been instrumental in developing the life of St. Nicholas Church from its founding and through a multitude of leadership ministries, notably ministries of music and hospitality.